A new study out in Biology Letters by myself, Devi Stuart-Fox, Terry Ord and Indraneil Das found that two populations of the same species of gliding lizard – Draco cornutus – have diverged in gliding membrane colouration to match the colours of falling leaves in their respective habitats. 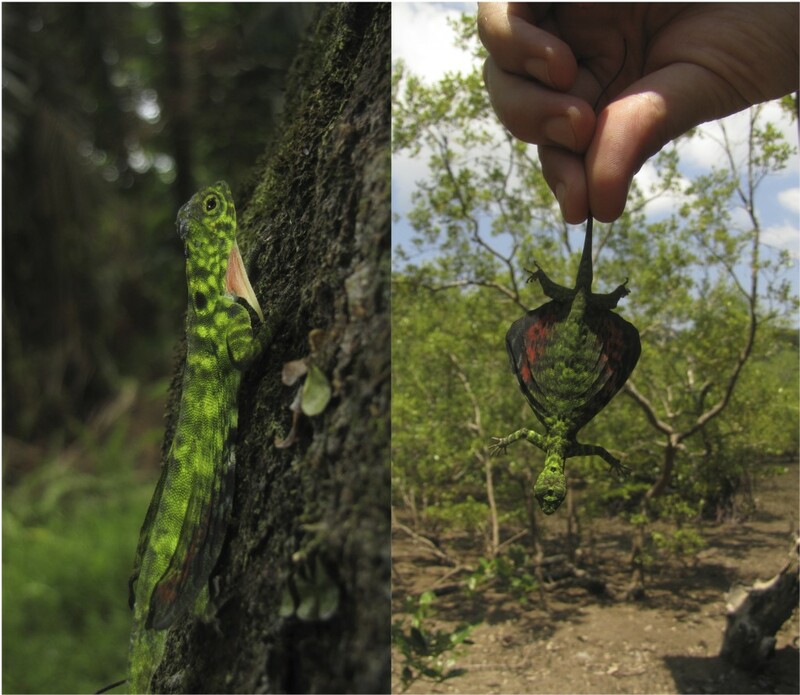 An Anole Annals post by Ambika Kamath earlier this year looked at the study briefly after we’d spoken at the Animal Behavior Conference in Princeton, but I thought I’d elaborate a little on working with Draco and how we devised the falling leaf camouflage hypothesis. Draco are small arboreal agamids, found throughout South-East Asia. They have extendable gliding membranes that they use for gliding between trees in their habitats. They also have dewlaps – like the Anoles – used in broadcast display to communicate with conspecifics. My work generally focuses on the diversity in dewlap colouration among species and how differences in habitat influence signal efficacy and may lead to speciation. This involves measuring the colours of lizards as well as taking behavioural footage of individuals of different species to look at how the patterns of display differ. Most Draco are very difficult to spot as they are well camouflaged and perch at least 3 metres high in their trees. Given this, searching for movement or displays are the best ways to locate an individual. Walking through the forest, we would often see in our periphery what we would initially dismiss as a falling leaf, only to later discover it was a gliding lizard. Indeed we quickly learnt to focus on ‘falling leaves’ when on the lookout for Draco and this was quite a fruitful approach. Indraneil Das was the first to suggest the gliding membranes were coloured to look like falling leaves – but it was a couple of years until we started to think about how we might test the idea. It became difficult to ignore how similar the fallen leaves on the ground at various study sites so closely resembled the colours and patterns of the gliding membranes of Draco species living in those immediate areas. Then we made to trip to Niah Caves National Park in northern Borneo and came across a second population of D. cornutus. We’d first encountered D. cornutus at Bako National Park, near Kuching, Borneo, and were taken by it’s vibrant green ventral colouration (similar to the standing foliage) and it’s contrasting red gliding membranes. Though we were seeing the same species at Niah, the gliding membranes of the lizards there were not bright red, but dark brown and green. Mangrove forests, like those at Bako, are dominated by a single species with bright green leaves that turn red before falling to the ground—but in the lowland rainforest at Niah the species of tree are more diverse, and falling leaf colours are predominately mottled brown and green. It seems obvious that red gliding membranes like those of the lizards at Bako would be highly conspicuous at Niah. First we laid out flat large plastic bags, as quadrats, beneath trees in which lizards were caught, to collect any leaves that fell onto the quadrat over 48 hours periods. We measured the colours of the standing leaves, falling leaves and the gliding membranes with a spectrometer and assessed how dissimilar the colours were from the colours of their local falling leaves to the vision of a predatory bird. We found that each population’s gliding membranes more closely match the colours of their local falling leaves than the standing foliage (ie. leaves still attached to the trees), or the falling leaves of the other population’s habitat. So, I think, this is a neat little natural history note, showing camouflage via ‘background matching’ but of a moving portion of the environment, rather than a stationary component. But it’s clear that this isn’t the whole story for Draco gliding membrane colouration. Like the dewlap, the gliding membranes are often strikingly or brightly coloured and we see diversity in colours among species. This suggests that, like the dewlap, the gliding membrane could also be use for communication. This hypothesis, first proposed by Jim McGuire, who has worked extensively on Draco, is based on his observations of the gliding membranes being extended during display, which suggests that they may be used for communication within and between Draco species, several of which can occur in the same forest. 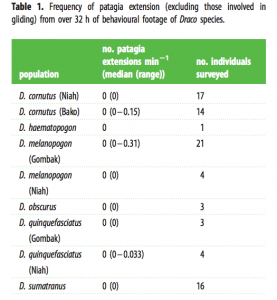 When we first started working with Draco we were expecting to see the gliding membranes used in communication as well, but after collecting over 30 hours of behavioural footage we found very few instances of wing extension for anything other than gliding (see Table 1). And compared with the use of the dewlap—clearly the primary component for broadcast display—we came to the conclusion that, at least for the species we’ve encountered, the gliding membranes don’t contribute greatly in communication. This footage by Rick Stanley also shows the gliding membrane being used in displays by Draco, although video clips tend to be selective. Still, it’s clear that some species of Draco, at least some times, extend their gliding membranes during displays, as McGuire observed. The question is: how important and widespread is this behaviour? In this blog post on the National Geographic site, McGuire points out that many species (though not all) show sexual dichromatism in gliding membrane colouration. He also suggests other interesting hypotheses for the colouration of the Draco gliding membrane. His position is: with evidence for only two populations of the same species matching falling leaves, it’s too early for us to be making conclusions about the whole genus. He’s absolutely right. Of course, the hypotheses that gliding membrane colour improves camouflage whilst gliding, by matching the colours of falling leaves, and the hypothesis that it aids communication within or between species, are not mutually exclusive. Colours that provide both camouflage and communication would yield significant survival and reproductive benefits, so would be favoured by selection. Whilst we suggest that the falling leaf mimicry probably occurs in other species (see figure 3) that remains to be shown. We suggest that this would most greatly benefit species living in habitats with a single or few tree species, so that most of the leaves that fall are the same colour, as well as species living in more open habitats with greater distances to glide between trees and more sparse canopy cover. Future field work with other populations will allow us to determine how generally applicable these findings are across the Draco genus. Figure 3. 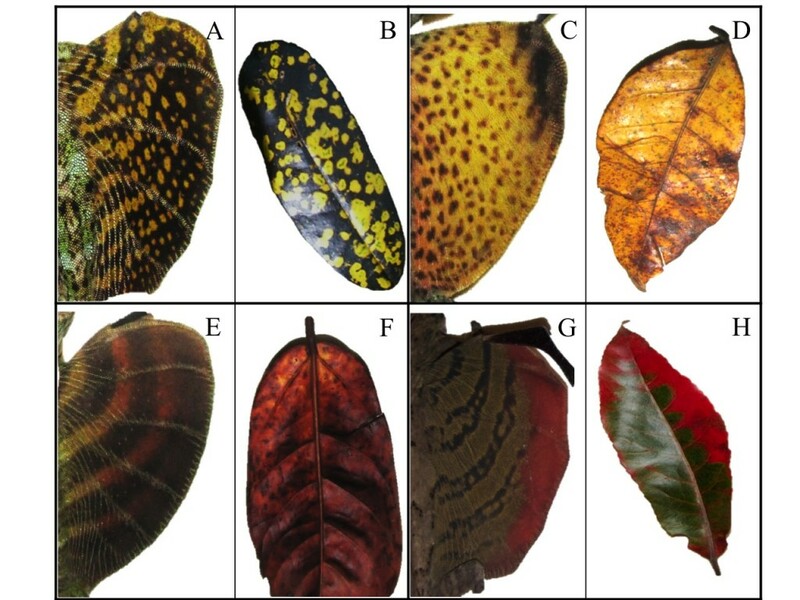 A) Draco melanopogan gliding membrane; B) opportunistically collected falling leaves from the habitat of D. melanopogan; C) Draco spilopterus gliding membrane; D) falling leaves from the habitat of D. spilopterus; E) Draco quinquefasciatus gliding membrane; F) falling leaves from the habitat of D. quinquefacsiatus; G) Draco formosus gliding membrane; H) falling leaves from the habitat of D. formosus.